With cellphones so ubiquitous, your watch choice can be less about telling time and more about personal style. However, a watch is not ‘just’ a watch. For example, the vast majority are made for right-handed people, but a select few cater to the lefties among us. There is a wide range in functionality and size. 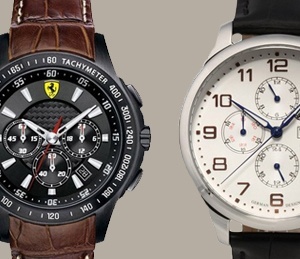 The wristwatch is also one of the few socially acceptable accessories for men, so why not have a small selection? If you’re not cashing a CEO’s paycheck just yet, here are the top 50 most handsome watches for men that retail for under $500. Featuring an indigo night light, tachymeter, a date window and a buckle closure, this watch is perfect for men who like to work or play outdoors. It is also water-resistant to 330 feet, making it a great choice for snorkeling or swimming. You won’t want to wear it for diving, however. With classic, black styling and a genuine crystal face, this is a timepiece that will stand the test of time in both form and function. This watch has all the bells and whistles you need, but presents it all in a plain and strikingly attractive manner. It features a date window in either English or Spanish, sword-shaped hands, a sweeping second hand and a mineral dial window. This is a great option for the man on the go. The canvas strap can be removed and hand-washed if sweat or other odors become an issue. This watch is not water-resistant, so you’ll only want to wear it when you won’t be popping by the pool for a swim! 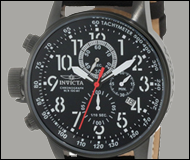 For those who prefer an all-metal timepiece, the stainless steel Invicta fits the bill nicely. Equipped with a unilateral bezel and removable links, the band can be customized to fit your wrist perfectly. The face is flame fusion crystal and features a magnifier to highlight the date window. It’s also water-resistant to 660 feet. If you’re looking for a gorgeous watch that stands up to an active lifestyle, this is an excellent choice. This watch features Japanese quartz movement that charges itself indoors or out when exposed to light, making it a great choice for those who don’t want to change out the battery too often. The stitched canvas strap is soft against your skin and will wick away moisture, while the mineral crystal face stands up to the rigors of your everyday life. Water-resistant to 330 feet, this watch is a classic and simple design you’ll be proud of for years to come. If you’re looking for a fun watch to pair with casual outfits, this is a great option. The band is blue and yellow woven nylon, and the face features both civilian and military timekeeping. An Indiglo night light is also included. This watch is water-resistant to 99 feet, meaning it can withstand splashes of water or exposure to rain but you won’t want to submerge it. This watch derives its power from either natural or indoor light and can withstand water depths of up to 330 feet. The supple brown leather band and timeless brushed steel give this piece an attractive look, and the alarm chronograph is easy to set. If you’re looking for a watch that can serve as a backup for your wake-up call while traveling, stand up to the elements and look awesome, this casual timepiece is a winner. For men who like a more gritty, industrial feel to their accessories, this Fossil watch is right on point. The bezel is gear-edged and the face is utilitarian black and gray. Water-resistant to 165 feet, this watch is a great choice if you like your adornments to be understated yet add visual interest. 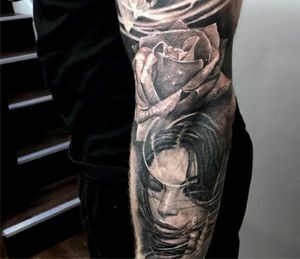 It’s definitely a stand-out piece, for those who would take notice! Another gorgeous offering by Invicta, this watch features a bold design with a slightly nautical feel to it. It will look at home whether you’re wearing a business suit or are going for a dive of less than 660 feet. This piece is also covered by a one-year warranty as a matter of course. The luminosity feature and magnified date window make it a great choice if you work or play in low light. If you like the feel of a pliable, non-metal band but aren’t comfortable with genuine leather, this watch comes equipped with a handsome synthetic band. At 46mm in diameter, this watch is perfect for men of smaller stature, as it will not overpower your hand or make it look like you’re wearing your father’s watch. With bold Arabic numerals and classic styling, this watch is an outstanding choice for the man on a budget. Famed designer Tommy Hilfiger is known world-wide for his luxury clothing, eyewear and luggage lines. This watch earns its name with sleek construction and bold use of black on the face and stainless steel on the strap. Water-resistant to fifty meters and packed with a variety of dials and features, this is one fashion statement that is built to do its job and look gorgeous at the same time. This timepiece features Gorilla glass, a built-in heart rate monitor and is compatible with Android 4.3+ smartphones. You can sync your watch with your phone and reconfigure the watch face with 100+ different options to suit your needs and tastes. If you love tech, this is the watch for you. If you like the look of a simple watch, this minimalist offering from MVMT is right up your alley. With just a plain black face, tick marks to denote the hours and a single date window, there is nothing overdone or extravagant about this design. It’s definitely a classy, low-key piece for the budget-conscious. With a textured silicone strap and a multitude of features, this is the timepiece for a man who likes to hunt, backpack or hike. The rugged construction, tachymeter, date window and orientation ring, in addition to three sub-dials, make it perfect for an outdoor life. It’s also water resistant to 165 feet. Boasting a 50mm diameter, this piece is perfect for the large-framed man or one who likes to wear his accessories oversized. A true fashion statement, this watch comes in eight different colors schemes to match your favorite hues. Do be aware, however, that the dial knob is configure for left-handed men! This watch was designed with the active man in mind. The knurled silicone band stands up to sweat and oils without issue, and the timepiece itself is water-resistant to 165 feet. The patterned bezel and quality craftsmanship of the face is excellent, as is to be expected from a Fossil watch. It even comes in the iconic and collectible tin! Featuring both Indiglo and a night light, you’ll never struggle to see the time in dim lighting with this watch. With a style that hearkens back to the era of WWII, the steel gray face and elegant hands are reminiscent of a bygone era. It’s also covered by a two-year warranty. Featuring a plethora of features and a smart, snappy style, this a great casual watch. The hardy resin band is adjustable, and the face is protected by a mineral window. Whether for work or play, this bold blue design is handsome and substantial on the wrist. It comes with Nautica’s five-year warranty at no additional charge. This watch is a chameleon piece. It looks at home riding below the cuff of your best suit, and it also looks great paired with jeans and a t-shirt. Backed by Fossil’s 11-year warranty as a matter of course and beautifully crafted, this smoke-colored piece is guaranteed to become the go-to accessory for nearly every occasion. The black, red and white face of this piece eschews the traditional two-tone color scheme so often employed in other watches, and the contrasting stitching on the band adds creative flair. It comes backed by Citizen’s five-year warranty and will compliment any casual outfit. Another gorgeous Kors creation, this watch sets itself apart by displaying the minutes in increments of five rather than the standard one through 12 configuration. Held by a buttery-soft, adjustable leather strap and featuring a deep blue face, this watch shows off classic lines with a new twist. Featuring delicate Roman numerals and graceful cut-out hands, this watch shows the quality we’ve come to expect from Fossil. It’s waterproof to 165 feet, making it suitable for an active lifestyle. It also comes backed by Fossil’s 11-year warranty and arrives boxed in one of their quirky, creative tins. This watch has three sub-dials for 12 hour, 60 minute and 60-second displays, in addition to the standard time. It also features a fold-over, push-down clasp on the stainless strap, keeping it secure throughout your activities. If you’re looking for a classy timepiece that shrieks sophistication, this is a great choice. Tired of wearing a series of round watches? 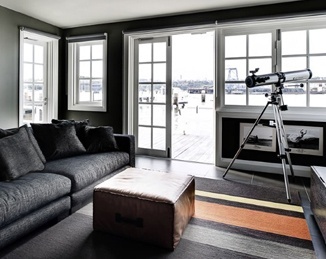 This piece has a truly unique rectangular casing that sits with the long ends horizontal. It has luminous hands and numbers, as well as water resistance to 99 feet. 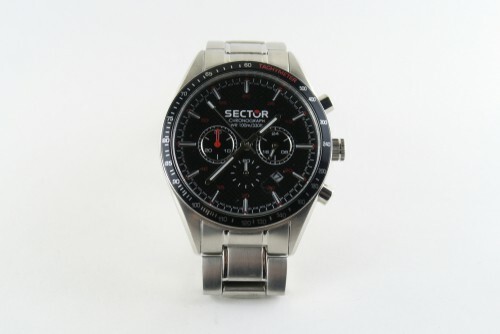 If you like a more industrial look, this watch will be a great addition to your collection. While just under our $500 budget, this watch is worth every penny. The intricate detail of this piece must be seen to be believed. Everything from the rippled bezel to the Swiss movement has been designed, polished and assembled to the highest jewelry standards. This timepiece is perfect for occasions where you’d like to exude good taste and a fashion-forward style. This classically-styled piece is accented with contrasting stitching on the bracelet and a printed tachymeter on the stationary bezel. With Swiss movement and a face composed of anti-reflective crystal, this watch will have place-of-pride among your accessories. Featuring luminous red numerals and hands against an ebony face, this watch is then brightened by the stainless steel casing and clasp band. It also showcases the date at the three o’clock position and sub-dials for a 24-hour military clock and a 60-second display. It’s definitely a solid timepiece and among the most contrasting available in its price class. Another not-quite-round offering on our list, the curved square casing of this piece gives it instant visual appeal. Sleek and clean, this unfussy design will be a compliment to almost any occasion. It’s water-resistant to 99 feet, making it a great choice for everyday wear. 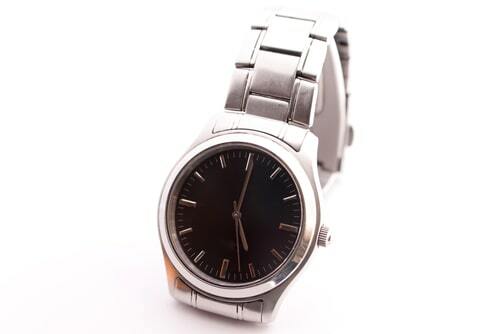 This attractive watch has an old-school feel to it, due to the white facing that was so popular in the 1960s and 1970s. The look, however, has been updated to a more modern style with the addition of three sub-dials and a black leather band. If you aren’t a fan of dark-faced watches or just want something slightly different for your collection, this watch is an excellent option. 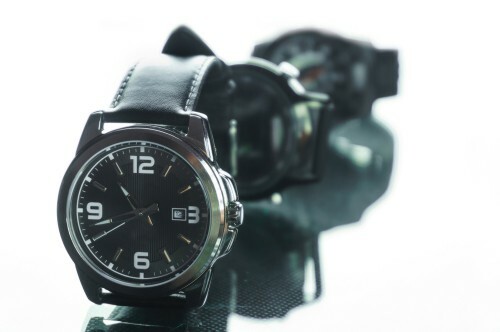 Internationally renowned design house Kenneth Cole puts out a lot of gorgeous products, and this watch is no exception. Crafted of black-ionized stainless steel, this watch bears cut-out skeleton hands and comes complete with the Kenneth Cole lifetime warranty. The price is also extremely reasonable for the quality of craftsmanship offered. Another on our list designed for left-handed men, this watch is something special. Water-resistant to 330 feet and featuring oversize stenciled numbers, this watch is great for any casual outfit. The cloth band is extremely durable and stands up to dirt, sweat and grime. If you lead an active lifestyle, this watch will be right at home in your collection. Designed by famed Italian fashion house Giorgio Fedon & Figli SpA, this watch has almost 100 years of fine craftsmanship behind it. While some watches are stunning in their complexity, this one is stunning in its simplicity. The minutes are denoted in increments of five and there are two sub-dials, but the watch has plenty of smooth, uninterrupted lines and space. If you appreciate simplicity, Fedon has put all of their considerable experience into this piece. This watch comes in a whopping 14 color variations, all of them beautiful. You may decide to add more than one to your collection! Designed in Sweden, this watch features Japanese movement, a stainless steel casing and the strap is made of Tärnsjö organic leather. TRIWA, which stands for Transforming the Industry of Watches, believes in the artistry of fine jewelry and it shows in their product. Another exemplary offering from TRIWA, the Sort of Black Chrono a similar take on their stunning Nevil Classic. Instead of placing the sub-dials horizontally at three and nine, this watch has them at 12 and six. This 90-degree spin on the facing is highlighted by different choices in texture, which helps keep the design fresh. Featuring luminous hands and indices, this watch is self-winding and water-resistant to 660 feet. The day and date are offered in both English and Spanish. The watch meets all the standards set by the ISO for safe SCUBA diving. If you love to get out into the water, this watch will go with you. It’s backed by Seiko’s three-year warranty. With bold white hour and minute hands and indices against a black background, this watch makes a bold statement. The sweep second hand is red, adding a splash of color. This is the official watch of the Swiss Railway and is water-resistant to 100 feet. Emblazoned with the Ferrari logo and strapped on with buttery-soft calfskin leather, this watch truly is a representation of luxury. With three sub-dials, Swiss movement and a tachymeter emblazoned on the bezel, the Scuderia shows off class and good taste. It’s ruggedly handsome and would be a fine addition to any discerning man’s wardrobe. Ingersoll has been producing quality timepieces since 1892, so it’s no surprise that this white-faced, timeless classic is being offered at a reasonable price. You can own a piece of history by supporting the company who first introduced luminous watches. 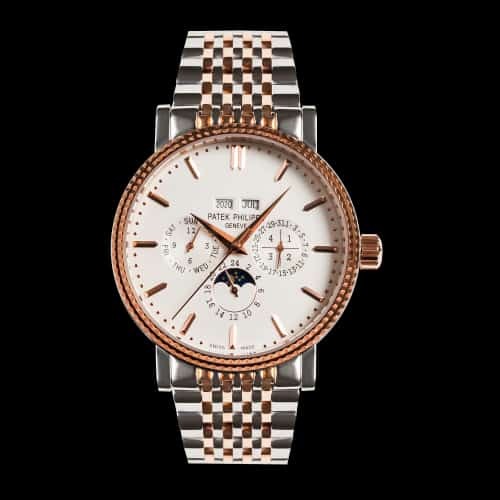 This piece is a great choice for a man who appreciates timeless beauty in his collection. Another fine offering from the makers of the Swiss Army knife, this watch is emblazoned with the internally recognized cross and shield emblem. It has no sub-dials, tachymeter or other add-ons to detract from its simple and appealing style. This watch will be at home with all but the most formal of outfits and carries a two-year warranty. While Giorgio Armani is known for haute couture, their sister label Emporio Armani is designed to bring that same high-quality style to the masses. The watch features a matte blue face, the standard three sub-dials and a matching blue leather strap with a buckle closure. Again, Ingersoll remakes the classics and brings them into the present day. With a highly polished stainless steel casing, two sub-dials, a date aperture and arrow-shaped hands, this watch is beautiful. The band features contrasting stitching on the fine-grain leather, adding depth and detail to the workmanship. This watch will compliment any casual occasion and can be relied upon for years to come. This watch has ion plate on the casing and the strap to give it its dark black luster, and features blue accents on the dials, hands and the buttons. The indices are set off with 12 inlays, and the strap is made of soft silicone. If you’re looking for a nice watch to wear out and about, the Marino is a good choice. If you don’t want to deal with changing out a battery, this watch is powered by either natural or indoor lighting. The mineral crystal face and stainless steel casing makes this watch water-resistant to 330 feet, making it a great choice for swimmers and snorkelers. 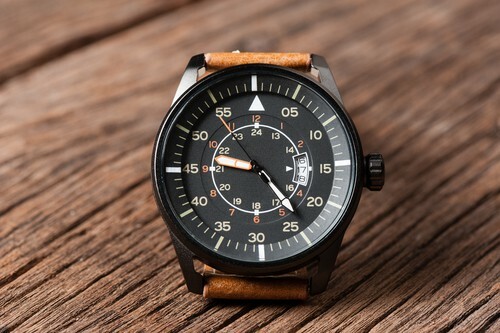 Handsome and utilitarian, this is a great watch for everyday wear. Are you ready for something a bit different? Bulova has been making watches and clocks since 1875 and they have used that impressive experience to put together a watch that is whimsical without being feminine or childish. 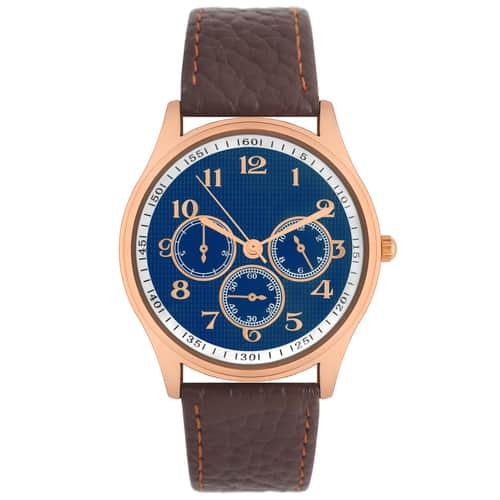 Everything from the cut-out font of the numerals to the quirky blue rubber strap is innovative and fresh. If you like to wear your playful nature, this is a great casual watch that shows some style. This dressy accessory from Caravelle of New York is perfect for a man who needs to dress to impress. The gray face and stainless steel work together to create a dignified and beautiful timepiece. This watch is an investment, as it will likely not appear dated for decades. Made with scratch-resistant sapphire crystal and Swiss movement, this watch is a smart and utilitarian choice. If you’re looking for a solid timepiece that isn’t flashy, this is an excellent option. It’s also guaranteed for two years. Are you getting tired of squinting down at your watch or holding it closer and closer to your face? Don’t worry, we all get a bit nearsighted with age, especially over the age of 40. If you’re not quite ready for reading glasses or a comically huge watch, this is a great choice. The numerals, indices and hands stand out in stark white against a black background, and the numerals are generous in size. It’s a perfect casual watch for the older gentleman. This simple watch has a clean, crisp aesthetic to it and doesn’t bog down its design with a ton of bells and whistles. It’s time and date, end of. If you want a watch for casual wear, this accessory is a shoo-in. The band is forgiving and comfortable against your wrist, and it’s blue color will likely compliment your existing wardrobe. The price is also extremely affordable. Featuring the Hilfiger logo at the three o’clock position, this watch is a statement piece. It is a bright, shiny stainless steel work of art that you’ll be proud to wear at all but the most stuffy of workplaces. The calfskin leather band uses a buckle closure and the date window is beside the logo at three o’clock. If you’re a fan of Tommy clothing, cologne or luggage, you can complete your look with this stunning accessory. Another watch designed with the older gentleman in mind, this watch features generously sized numerals that do not appear comical to the casual observer. It’s also an excellent choice if you take your contacts out at night and still want to be able to check the time. With classic lines and a simple white face, the watch would not be out of place at any casual gathering. It comes with Timex’s one-year warranty at no additional charge. Another lovely offering by Fossil, this piece features slim Roman numerals and delicate cut-out hands. The casing is stainless steel and is water-resistant to 165 feet. The band is made of supple, soft calfskin leather and uses a buckle closure. Of course, this timepiece also comes with the generous 11-year warranty and it’s own fun tin. This watch oozes class and is great for nearly every occasion in your life.